Becoming an elementary school teacher these days is a great career move, in spite of a bad economy. This is so because teachers, like healthcare workers, are essential personnel. In fact, what students learn (or fail to learn) during the age levels of Kindergarten through 6th grade (what “elementary” generally refers to) profoundly affects how well students do academically in high school and beyond. What Skills/Attributes Do Elementary School Art Teachers Need? A good sense of humor, since this is probably one of the best defenses against stress. Above –average interpersonal skills—important not only in dealing with poor-behavior/troublesome students but, also, irate parents, demanding school officials, and sometimes-difficult-to-get-along fellow staff. Sense of creativity and play—especially important for art teachers. Talent, training or superior skills in at least one craft—i.e., sculpture, painting, ceramics, drawing, etc. How Do You Officially Become a Teacher? Of course, the most important step in becoming a teacher is obtaining the necessary education. This generally involves getting a 4-year bachelor of science or arts; after this, you will need to take teacher education classes, unless such are included in your special BA or BS (as would be the case for B.A.Ed. degree). Usually as part of alternative plans for teacher certification, you can also pursue a master’s in education or teaching. In addition to getting a graduate degree, you qualify for certification, if you can meet the other criteria. Such “other” criteria includes passing special proficiency exams such as the PRAXIS exams administered/overseen by ETS or the Educational Testing Service; taking national certification exams (though these are usually optional), such as the National Board of Professional Teaching Standards (NBPTS); passing background checks; and taking part in a student-teaching residency or internship. After meeting all these criteria, you can then be licensed/certified to teach in the state of your choice. Although some industries have actually lost jobs, teaching is expected to have some increases for three main reasons: the total number of students is expected to keep increasing; some states are offering special incentives for older teachers to retire; and states are trying to cut the teacher-to-student ratio in order to improve academic performance and decrease burdens on individual teachers. 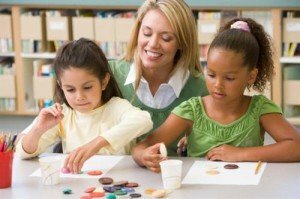 According to the US Bureau of Statistics, in fact, jobs for elementary school teachers are expected to see a 17% growth rate by 2010. Although the average salaries for starting teachers is about $30,000.00, teachers on the job with experience rake in about $51,000.00, on average. This figure improves if they specialize (e.g., Special Education, ESL, STEM certification, etc. ), pursue graduate degrees and take professional development programs/classes. What Topics Will an Elementary School Teaching Program Cover? There is no question that becoming an elementary school teacher is a great career move. Pursuing such a career, though, can only happen if you make the right steps. To that end, find a school with a good solid record in graduating teachers. After you find such a school, enroll and then find out what else you have to do to get certification. After you complete the process, you will discover what a difference you can make in the hearts of many students. You will be proud of what you accomplish!